Langkawi is an group of 99 islands surrounded by the turquoise waters of the Andaman Sea. The main island is filled with jungle covered mountains, rice paddy fields and beautiful stretches of beaches along its coast. This provides ample opportunities for fun and outdoor adventure for visiting families. However, there are only a few ways to get off the mainland and explore the various other islands that surround it. The absolute best way to do this, and one of the most popular things to do in Langkawi is a jet ski island tour with Mega Water Sports. 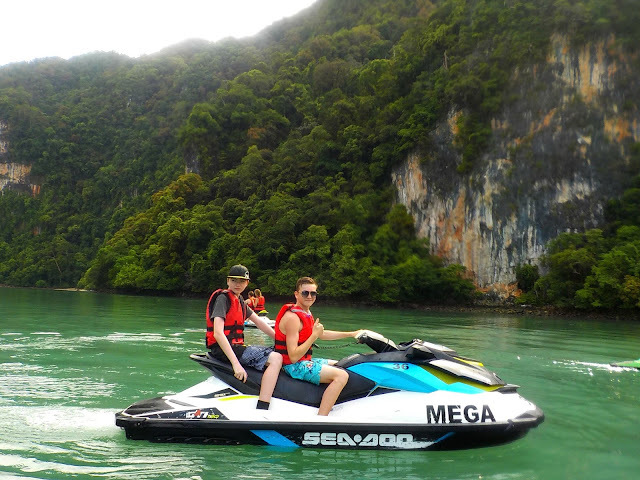 We were lucky enough to be invited to experience one of these island hopping jet ski tours with Mega Water Sports during our visit to Langkawi. We took the Tour 1, a four hour tour which is perfect for beginners and families. On this tour, you get a chance to experience several smaller islands surrounding the main island of Langkawi, and see some sites that would not otherwise be possible, including one of the areas where they harvest the swallow's nests for making bird's nest soup. On the morning of our tour, the boys and I met up with our Mega Water Sports tour guide Patrick on the Pantai Cenang Beach, a location that was easy to find and just a short walk from our resort. The boys loved Patrick, and he really did make the tour, with his smile always at the ready, his incredible knowledge of the area and the fact that he reminded the boys of Maui from Moana. 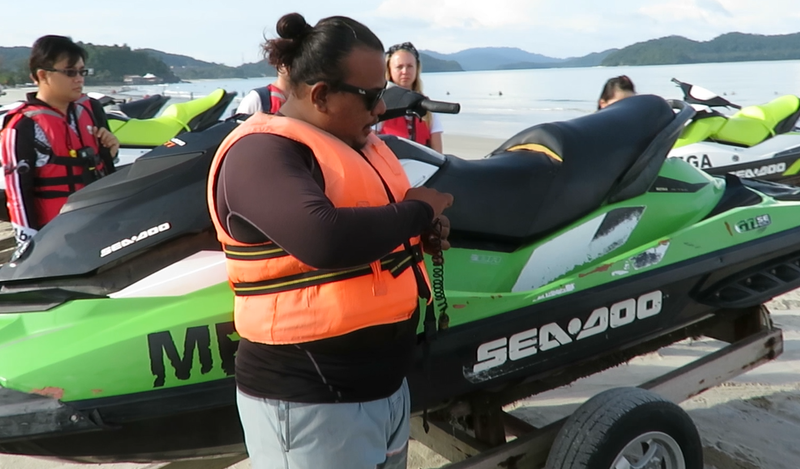 Having never ridden on a jet ski before, I was a little nervous about how everything was going to work, but I was instantly put at ease with the thorough safety briefing that we underwent before getting into the water. We were given waterproof dry bags for storage of our phones and other items, water boots and life jackets, and then taught the correct V formation we would be traveling in, as well as the safety features of the jet skis. Mega Water Sports is one of the few companies to utilize jet skis that have idle and reverse features, making their safety standards much higher than other tours. After the briefing we headed off to our first stop. We passed by Pregnant Maiden Island where Patrick gave a great overview of the island's history including why the island has its name. Legend says that a maiden became pregnant after one kiss from her beloved, and when he returned home to find her pregnant, he cursed her to remain forever as a mountain shaped like a pregnant maiden. They say if you drink from the fresh water lake on the island, you will become pregnant. Seeing as I already have four boys, I didn't test that theory. We then stopped for a swim by a smaller secluded island before heading off to the fjords and cliffs. It was amazing to be able to get so up close and personal with the fjords and cliffs in the middle of the sea. We road single file right next to them as Patrick explained about the Eagles and Swallows that call it their home. He showed us the side of a cliff which resembles the face of a man, and the location where locals come to climb the steep cliff-face more than 50 meters up to harvest the swallow's nests for making bird's nest soup once a year. We then rode across the sea back to Pregnant Maiden Island to visit the island itself. It was fun to go sightseeing on the island, to swim in the freshwater lake and to evade the mischevious monkeys. 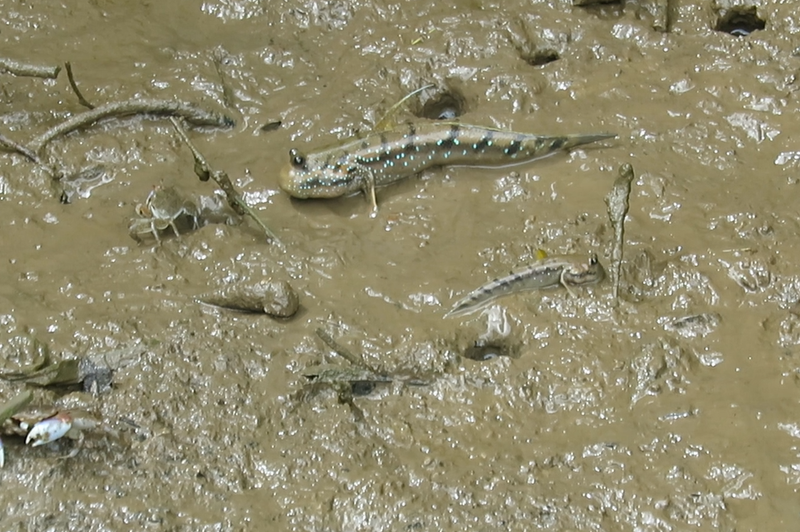 There are also wild pigs on the island, and if visiting with kids, don't miss the chance to see the mud skippers right by the dock, the boys were extremely interested in them. We had 45 minutes on the island, and there are plenty of options for activity. This is the only location on the tour that has food and drink options as well as a toilet, so take advantage of those while you are here if you need to. You can also visit the fresh water lake for a swim, to let the fish nibble at your toes, or to try and of the other recreational activities they have there like paddle boat rentals. On the way to our next stop, we took a break in the middle of the sea for some fun free time. During this time, we were given free range to play around with the jet skis and do whatever we wanted within reason. It was a great chance to take a break from the regular V formation and really see what we could do with the jet skis. The next stop on the tour was Singa Besar Island where we did some eagle watching. The eagles here are very protected, and there are several different speices. Tour boats come from all over just to watch them, and people who are given permission come there to feed them each day. Our last stop on the tour was by far our favorite. We visited a small secluded island where we were able to get out and explore on our own deserted beach. It was amazing to be in the clear turquoise waters, free from other tourists and soaking in all of the beauty that Langkawi has to offer. Once back on the main island of Langkawi at Pantai Cenang Beach, we were given instructions on how to get a link to our tour photos from the Mega Water Sports Facebook page. This is the only tour that provides complimentary photos taken by your guide during your tour. It was amazing to know we could really soak in the fun on the tour and not have to worry about catching every photo ourselves. An island hopping jet ski tour is probably one of the most amazing things to do in Langkawi and there is no better company to do it with than Mega Water Sports. We are so thankful that we got a chance to experience this tour, as it is unlike anything we have ever done before, and is definitely the best way to experience the islands of Langkawi. To find more information on the various tours offered and pricing, visit the Mega Water Sports website.